The Walter Camp Football Foundation has announced the Football Bowl Subdivision National Offensive and Defensive Players of the Week, presented by Generation UCAN, for games ending October 24. Luke Falk completed 47-of-62 passes for 514 yards and five touchdowns as Washington State defeated Arizona, 45-42. Falk has scoring passes of 6,43, 2, 6 and 9 yards as the Cougars improved to 5-2, 3-1 in the Pac-12. Notes: Luke Falk the first Washington State player to earn Walter Camp National Player of the Week honors since 2004. 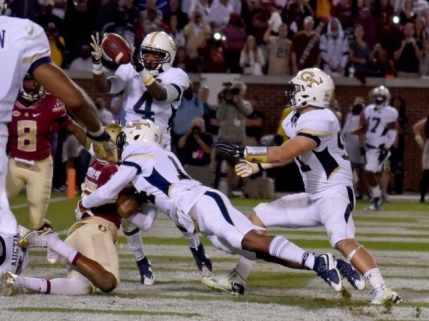 Jamal Golden recorded nine tackles (7 solo), including one for a loss, and had one interception as Georgia Tech defeated ninth-ranked Florida State, 22-16. The Rambling Wreck defense held the Seminoles to just 280 yards of total offense in the contest. Notes: Jamal Golden is the first Georgia Tech player to earn Walter Camp National Player of the Week honors since 2004.